After you move the VM, its sessions remain intact. 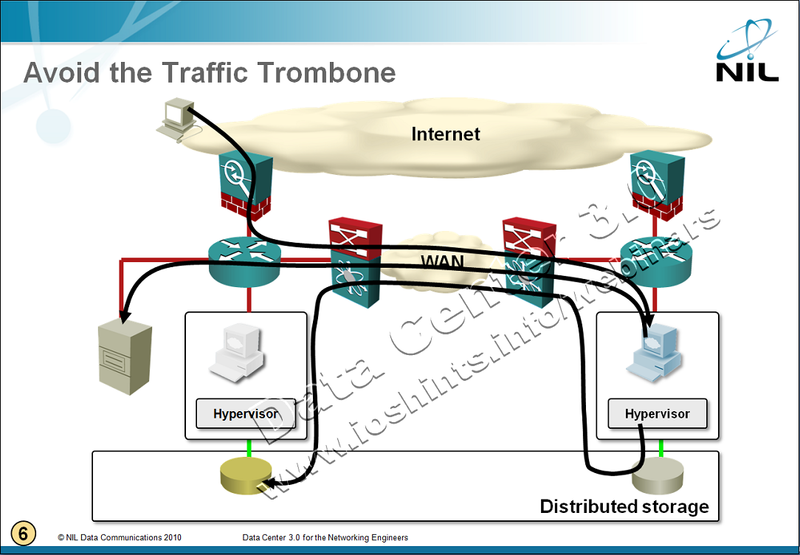 The traffic to/from the Internet still has to pass through the original firewall/load balancer (otherwise you’d lose the sessions) and the database traffic is still going to the original database server (otherwise the web applications would generate “a few” database errors). Even worse, in many cases all disk write requests generated by the VM would have to go back to the primary data center. 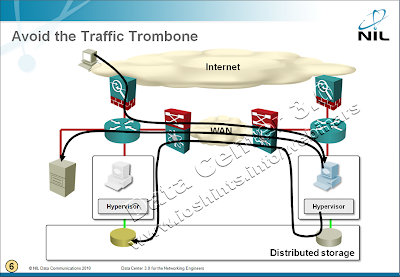 The resulting traffic flow spaghetti mess was aptly named the traffic trombone by Greg Ferro. Storage vMotion can be used to transfer the virtual disk file to another logical disk (LUN) with a primary copy in the second data center, effectively localizing the SAN traffic. (Speculative) SAN write requests might be quickly optimized if the virtual disk file (VMDK) is stored in a truly distributed NFS store (as opposed to active/standby block storage). To give you a real-world (actually a lab) example: Cisco and VMware published a white paper describing how they managed to move a live Microsoft SQL server to a backup data center ... resulting in ~15% performance degradation and unspecified increase in WAN traffic. Now that you know what’s behind the scenes of long-distance vMotion, please tell me why it would make sense to you and where you’d use it in your production network ... or, even better, what business problems are your server admins trying to solve with it. Oh, and I simply have to mention the Data Center 3.0 for Networking Engineers webinar, it’s full of down-to-earth facts like this one (buy a recording or yearly subscription). Does VMware even support long distance vMotion? I don't think they like to even like to admit that vMotion works between two ESX servers on different subnets. :) I believe things are going that way, but it is still pretty messy and there are lots of caveats and design considerations. If I remember right, EMC has been discussing a setup with VPLEX that uses synchronous replication on the storage side (block) so that traffic can be localized even when vMotioning between two sites (distance limited for the synchronous part). >Does VMware even support long distance vMotion? For all versions, except ESXi 5.0 Enterprise Plus, the limit of vMotion is maximum 5 ms roundtrip time between the hosts. With the Enterprise + license the limit is increased to 10 ms. It seems like long-distance vMotion is a good solution for server applications that use relatively little CPU, work mostly from RAM, make few disk requests, and absolutely must remain connected to the clients. Would a solution for Virtual server movement not be to run a small routing instance on the server, use /32 ip's and when it moves just update the global routing table ? DING!!! Your answer is correct. However, the current routing protocols are too slow (the convergence would take a few seconds unless you want to tweak OSPF really badly) and we lack a mechanism to detect host movement reliably - we would need L3 functionality in the vSwitch or some other registration mechanism. Obviously there's no L3 switching in the vSwitch or NX1K and even if it would be there, it would eat CPU cycles as it would have to participate in the routing protocol. Back to the good old LAM days? :) I just want to stress out that OSPF/ISIS could be *easily* tuned to converge within 10s or 100s of milliseconds without impacting network stability, provided that network links are point-to-point and support fast failure detection. Sub-second IGP convergence has been heavily studied and experimented with since late 90s and it is actually a regular practice in cases where you want fast convergence without the complexity of link/node protection (plus IP FRR could be deployed in addition to IGP re-routing). The deployment scale was as large as up to thousand devices in producton, so there are no inherent limitations in IGP convergence (though moving to a better dynamic SPF might be a nice improvement). All other migration factor are subject to discussion, with management and control plane overhead being among the main show-stoppers. Yup, I've discussed the option of using LAM for this kind of thing. The main problem with it is that there's zero VRF support. If vendors redeveloped it and implemented VRF-awareness then there could be done mileage in it.